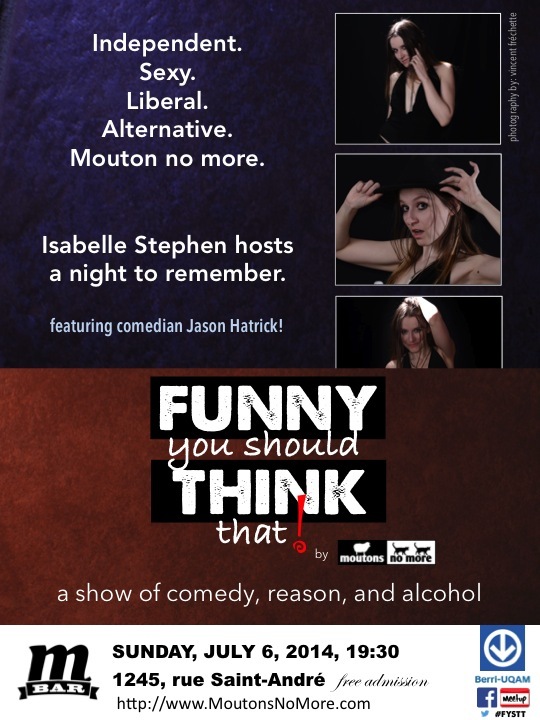 This Sunday: Funny You Should Think That! A show of comedy, reason, and alcohol. FUNNY YOU SHOULD THINK THAT is a monthly event (intelligently) designed to make you laugh and think. Moutons No More takes to the stage with amazing guests to talk pseudoscience, lambast religion, and get you to think more critically. It’s like the Rolls Royce of Skeptics in the Pub and just what Montreal need. Come for the show; stay for the conversation. This month, Isabelle Stephen hosts a night to remember. A dance number, a live song, a panel discussion on free speech, and comedy! The production team of Moutons No More is joined by returning guest David Kaldahl and stand-up comedian Jason Hatrick! The entrance to the bar is at the back of the hostel which is on Saint-André street. Don’t let the rapey alley fool you: open the silver door, walk down the stairway to heaven, and you’ll end up in good company! To RSVP through Facebook: search for “Funny You Should Think That!” in the search bar and you’ll find the event. To RSVP through Meetup: go to http://www.meetup.com/Moutons-No-More/ and scroll down until you find the event. “Funny You Should Think That!” is best enjoyed surrounded by friends, so spread the word around and make it a group outing! This is our last show of the summer! Tags: funny you should think that, moutons no more. Bookmark the permalink.